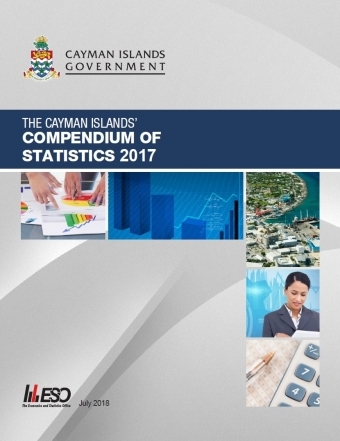 The Cayman Islands’ Compendium of Statistics 2017 released today by the Economics and Statistics Office is a comprehensive collection of statistics from various public and private sector data sources covering population, demographics, social and living conditions; the economy, finance and development; the environment; and information and communication technology. In social services, the total number of families who received assistance from the Needs Assessment Unit increased in FY2016/2017 to 2,049 compared to 1,805 in FY 2015/16. All types of assistance were higher, with the highest increase of 254.1 percent recorded for those who received miscellaneous supplement while those who received assistance with pre-school expenses rose by 195.2 percent and propane expenses by 115.1 percent. In environmental health, the total waste at the landfills increased by 3.9 percent to reach 106,054 imperial tons compared to 102,074 tons in 2016. The total waste incinerated during the year was 300 tons which was higher by 1.0 percent compared to 297 tons incinerated in 2016. Among selected economic indicators included in the Compendium, new ships registration increased to 241 in 2017 from 234 in 2016, traced mainly to growth in pleasure yachts. Meanwhile, the volume of mail declined sharply by 32.9% in 2017 to 3.9 million in comparison to 5.8 million in 2016 with both out-going and incoming (foreign) mail declining. For more information on The Cayman Islands’ Compendium of Statistics 2017, visit www.eso.ky.